This approach to harnessing existing resources in a nimble and flexible manner, underpinned by technical support, is facilitated by our multidisciplinary staff group which offers a unique blend of skills focused on policy, practice, research and evaluation, service design and digital media. This team generates an environment in which ideas cross-fertilise and a culture that is open to, and confident with, change and experimentation. The principles outlined above shape IRISS’s approach to cost effective and innovative evidence informed practice. Much of our evidence-informed practice activity is characterised by the development and trial of innovative methods and approaches, building on what is already known but moving into the unknown, trying things out where there are no guarantees of success. Our stance is that whether innovation is radical or incremental, it implies a real change in how things are done (IRISS, 2011). While acknowledging the complexity of the implementation process, IRISS’s approach is pragmatic, seeking to accommodate the practical realities of achieving evidence-informed practice in a cost effective manner. Our work is characterised by four pillars of activity, depicted below. This builds on Ward et al (2009) who identified three possible roles for those supporting the knowledge translation process: information management (helping teams find, package and disseminate information), linkage and exchange (facilitating discussions between the teams and relevant experts) and capacity building (helping teams develop their capacity to exchange knowledge). Meyer defines these three groups respectively as knowledge managers, linkage agents and capacity builders (Meyer, 2010: 121). Our approach also draws on Best et al (2008) who identified three distinct generations of knowledge to action models. The first generation, linear models, dominant from the 1960s to the 1990s, focused on research dissemination as the route to action. Relationship models become more common in the 1990s, in recognition of the need to build relationships between policy, practice and research. Most recently, Best et al suggest, there has been a focus on systems models as the most important factor in improving knowledge use, focusing on the way in which knowledge is embedded within organisations and systems. Each pillar of our evidence-informed practice work broadly relates to a different element of the knowledge to action journey outlined by Best et al (2008) and Ward et al (2009). 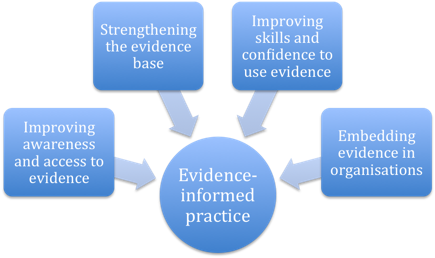 Improving awareness and access to evidence builds on information management thinking and approaches; strengthening the evidence base includes elements of linkage and exchange (focusing in part on strengthening the evidence base through strengthening connections and understanding) and capacity building (focused on filling gaps in knowledge which limit social service action); improving skills and confidence to use evidence relates to capacity building; and embedding evidence in organisations builds on systems and organisational models.